NSCD graduates this year have gone on to win numerous contracts with professional companies internationally, including tanzmainz, Matthew Bourne's New Adventures in Motion Pictures, Russell Maliphant Company, Rosie Kay Dance Company, Phoenix Dance Theatre and Tavaziva Dance. More graduates than ever have secured apprenticeships and places on postgraduate programmes in connection with the School and many are pursuing their own independent creative projects. We are delighted that such a high number have gone on to enter the profession, or further study, and wish all our graduates a healthy start to rewarding and fulfilling careers in the arts. The 2018 graduating cohort comprised; 28 Access; 44 BA (Hons); 7 PG Dip and 22 Masters students. Of the 28 students who completed the Access course, 24 have gone on to study at NSCD or other conservatoires. A record number of our students who graduated from the BA (Hons) in 2018 have gained places with professional companies as apprentice dancers on the school's Postgraduate Apprenticeship Scheme (PAS) in the UK and abroad. In August Nora Monsecour moved to Germany to join tanzmainz, and has already been offered a contract to continue working with the company as a professional dancer once her apprenticeship finishes. Fabian Jackson joins Candoco Dance company, Chanelle Harris has begun working with ACE Dance and Music, Rebecca (Boo) Knight joins Motionhouse and Rachel Sullivan and Daniel Lukehurst are currently dancing with Company Chameleon. Joining 2Faced Dance Company this year are Cameron Woolnough and Sean Moss- who began with the company during his final term of study. Phoenix Dance Theatre welcomed three NSCD graduates as apprentices this year: Elliott Augustine, Jasmine Gordon and Frances Shepherdson. Roisin Whelan joins Black Box Dance Company as an apprentice dancer and has secured a full-time contract with Matthew Bourne’s New Adventures in Motion Pictures while Moronfoluwa Odimayo has a contract with Russell Maliphant Company lined up in addition to projects with Gavin Coward and TRIBE company. Jack Hilton took on a full time role with BalletBoyz as a company member following a year of apprenticing alongside his final year of undergraduate study, and has set up a new company ‘FIN’ with fellow graduate Callum Osbourne. Imogen Reeve, Marie Kohl and Eva Leemans have also set up their own company – Excessive Human Collective and have already been successful in securing funding for future work. Petra Linnet has progressed onto NSCD's MA in Dance & Creative Enterprise to pursue her own career in performance as an independent maker. NSCD's postgraduate company VERVE welcomed a total of 7 NSCD graduates this year: Glenda Gheller, Maya Carrol, Mario Araujo, Jack Butler, Isabella Dubroca, Henry Morris and Henry Ward, while Diogo Santos is at the Experimental Academy of Dance, Salzburg as a member of the Bodhi Project performance company and Natasha Arcoleo and Kate Forster have joined EDGE, the postgraduate performance company at London Contemporary Dance School. Lucy Jones, Emma Hopley, Francesca Perazzolo and Matilda Maginnis all joined Joss Arnott’s new postgraduate company Emergence at the University of Salford. Sara Fusato joins JV2, studying towards a Professional Development Diploma with Jasmin Vardimon Company and Tania Pinto has begun a postgraduate dance teaching programme in Portugal. This year's undergraduate award winners included Nora Monsecour, for Professionalism and Achievement, Jessica Fraulo Ryder for Writing, and Callum Osbourne and Diogo Santos for Creativity. Thomas Forry was awarded the Margaret Dunn Dance Teaching Award and Roisin Whelan was awarded the Kathleen Tattersall Leadership Award. VERVE 18 dancers have gone on to secure work with a wide range of companies, as well as teaching and pursuing their own choreographic interests. Alethia Antonia has secured current and future contracts with Russell Maliphant Company and NSCD alumnus Jamaal Burkmar, in addition to work with Ion Tribe/Luke Jessop and NSCD alumna Heather Walrond Company. Sharol Mackenzie has current and future contracts with Matthew Bourne’s New Adventures, Richard Chappel Dance and Mark Bruce Company, and is developing a solo work of her own, while Michele Scappa joins Titoyaya Dansa in Spain, led by Artistic Director Gustavo Ramirez Sansano. Maria Elena Bolelli will move to Denmark in January to join Black Box Dance Company after being offered contracts with Iceland Dance Company and reaching the final 3 shortlisted to join Rambert Dance Company. Katy Hewison is working on an ACE funded project, Rural Steps, setting up two new youth companies in North Yorkshire as well as working with Vanessa Grasse, and Anders Engebretsen is working for pre-vocational school Spin-Off in Norway as well as undertaking freelance performance work. 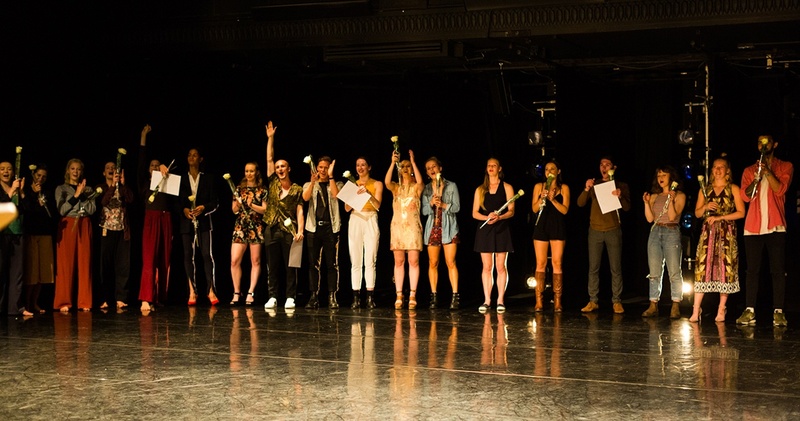 This year Ruby Portus showcased new work at Sadler’s Wells as part of Sadler’s Wells Young Associates, a new initiative launched to support talented young choreographers at the very outset of their careers for a period of two years. Daisy Howell is working with her own company- Brink on various projects including a mixed-mode collaboration with DJs and artists in Manchester commissioned by the Lowry. The following Postgraduate Apprentices were each offered full time or freelance contracts with their host companies on completion of their studies: Aaron Chaplin (Phoenix Dance Theatre), Sara Marquez (Company Chameleon), Asmara Cammock (Tavaziva Dance Company), Nicole Victor (Tavaziva Dance Company) and Beth Pattison (Motionhouse). Alice Bonazzi and Carina Howard join Rosie Kay Dance Company, and Erica Mulkern joins Leeds-based Balbir Singh Company while taking on various sponsored performance projects in the fields of fashion, sports and education. Shawn Willis and Gilbert Ratcliffe are each pursuing freelance ventures in teaching and choreography. MA Dance & Creative Enterprise graduates are also enjoying success- João Maio recently completed a UK tour of Rosie Kay's M.K Ultra, and started work as a creative producer for Open Source Arts in Leeds, Sisi Li is continuing her postgraduate studies in Choreography at Trinity Laban, Conservatoire for Music & Dance, and Misato Shimizu is working on a new site-specific, multidisciplinary art project in Tokyo. Misato has also been selected as a featured choreographer for Let's Dance International Frontiers 2019 in Leicester, and will perform a solo work in May. Have an update for us? Get in touch at alumni@nscd.ac.uk- we'd love to hear what you're up to!